Organic Reactions ( Vol. 78): 9781118356364 Hardcover - LIMEROCK BOOKS INC. 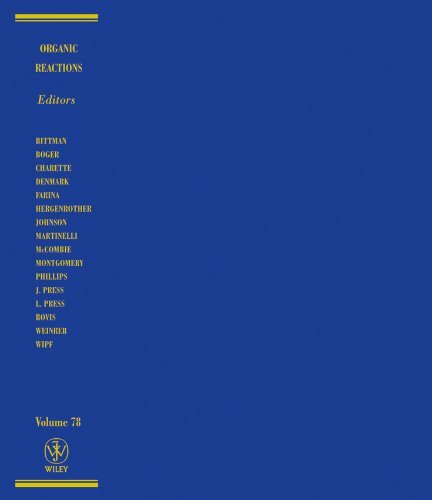 This volume in the venerable Organic Reactions series contains three chapters focusing on the introduction or the removal of nitrogen from organic compounds. The first chapter features a classic chemical reaction for introducing nitrogen into organic compounds, namely the Schmidt Reaction. The second chapter highlights a less-well-known yet fascinating transformation that introduces nitrogen into organic compounds, The Neber Rearrangement. The third chapter describes an unusual class of reactions that involve the loss of small molecular fragments from a ring, where separate carbon atoms unite to form alkenes. <b>Scott E. Denmark</b> received his undergraduate degree from the Massachusetts Institute of Technology in 1975 and his graduate degree (D.Sc. Tech.) from the ETH-Z&uuml;rich in 1980. He joined the faculty at Illinois in the same year. His research interests are in structural, synthetic and mechanistic organic chemistry.